People First is a self-advocacy organization. 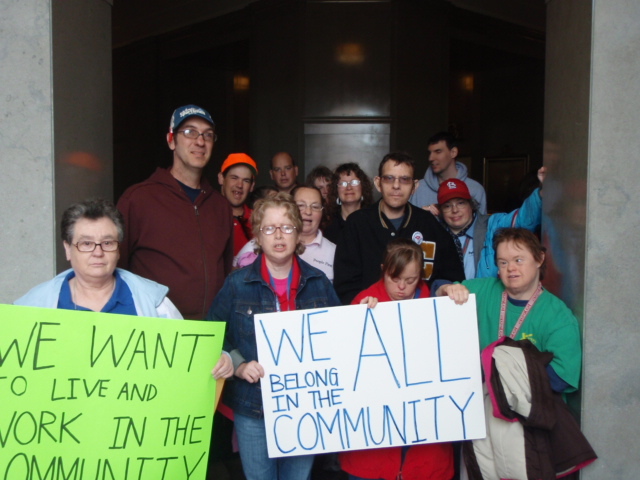 The members of People First formed the organization to be run by and for people with developmental disabilities, but membership is open to anyone. We are citizens, with rights and responsibilities, and with ability to contribute to our community. We’re getting to know our fellow citizens and public officials and showing that beyond disability, we are people, first. We celebrate the differences between people and are building on each others’ strengths. A major goal of the organization is to make sure people with disabilities are fully included in community life. We believe in civil rights for all people, whether they have a disability or not. What else do People First members do? People First members are very involved. They represent their local chapter at the State, National, and International levels. They participate in local and legislative advocacy, an annual self advocacy retreat, and join the other members in social activities such as dances, movie nights, picnics and potlucks. People First of Boone County meets monthly at the Boone County Community & Family Support Center, 1209 E. Walnut. Membership is open to anyone interested in advocacy for a better community! For meeting dates & times, contact Mark at 874-1995 ext. 154 Come check us out! !